Har gow — shrimp dumplings — dipped in soy sauce with chili paste are tiny flavorful umami bombs. Making the shrimp filling is quick and easy but making the dumpling wrappers from scratch is a bit challenging. From making the dough to forming the wrappers, the process is somewhat tedious. If you don’t have the luxury of time, you can use Asian-store-bought dumpling wrappers instead; but if you do, I assure you that your efforts will be rewarded with tasty homemade dumplings. Mix the ingredients for the filling thoroughly. Set aside. In a medium bowl. 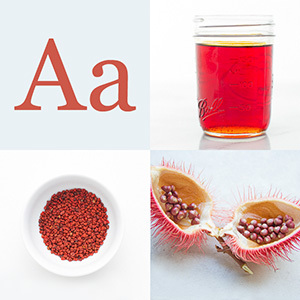 combine the wheat starch, tapioca starch, and salt. Here is an important note: wheat starch is different from wheat flour but tapioca starch is the same as tapioca flour. I got my wheat and tapioca starch from the local Asian store. Add the boiling water and canola oil and stir well with a wooden spoon. Transfer the dough while it is still hot onto a clean surface dusted with wheat starch. Knead until smooth, adding a little more wheat starch, if necessary. The dough should be soft but not sticky. Divide the dough into four equal parts. Use your palms to roll each part into an 8-inch log. Cut each log into 8 pieces. Place the pieces, together with the rest of the dough, in a bowl and cover with plastic wrap to keep them moist. Flatten each piece of dough into a round dumpling wrapper. Cut 6-inch square sheets of parchment paper. Place a piece of dough in between two sheets of parchment paper. Using a knife or the bottom of a flat pan press down on the dough to flatten the dough. 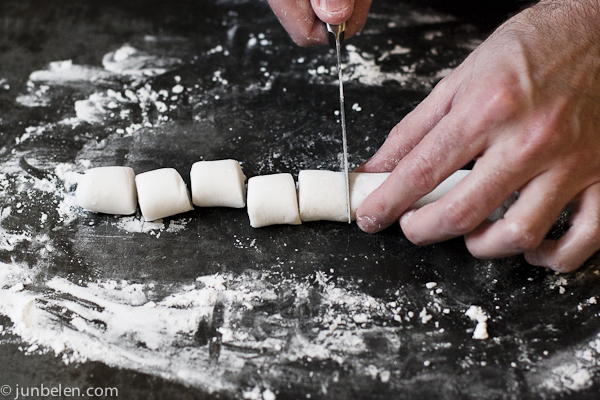 Then using a rolling pin or the round end of a wooden spoon, roll out the dough further to make it larger and thinner. Rolling it too thin makes it too fragile and easy to break. The round dumpling wrapper should be at least 3 to 4 inches in diameter. Peel off the parchment paper. Place the wrappers in a separate bowl and cover with plastic wrap to keep them moist while you continue working on the rest of the batch. Alternatively, keep the wrappers in between two sheets of parchment paper. Working with the wrapper to make the dumpling is the trickiest part. Rolling the wrapper to get the right thickness — neither too thick nor too thin –- is key but wrapping the filling requires a certain technique, which can only be learned and mastered through practice. 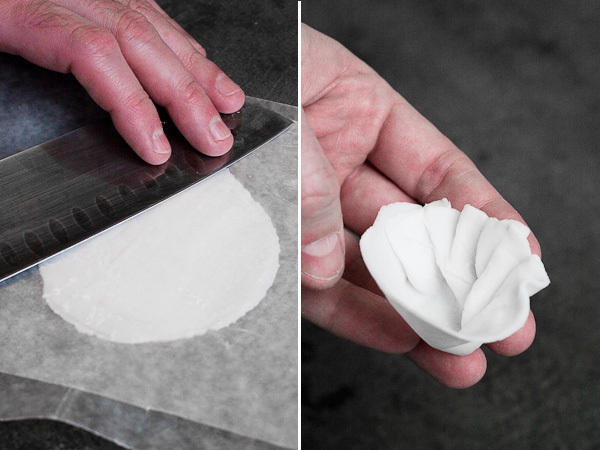 Form each dumpling wrapper into a cup with overlapping pleats on one side. Dennis learned pleating rather quickly; I honestly didn’t and made unpleated cups instead. The important thing to remember is to form the wrapper into a cup that you can fill. If you go the pleated route, remember to leave about 1/3 of the circumference of the wrapper without pleats. Spoon about a teaspoon of the shrimp filling into the pocket and keep the filling from touching the open edge of the wrapper. Close the wrapper by pressing the edges of the wrapper together, forming a half circle. I recommend making the wrappers in the whole batch first and then make dumplings. Set up your steamer and bring the water to a boil. Steam the dumplings over high heat for 7 minutes. Let the dumplings rest for a few minutes before serving. My mom used a tortilla press to make the har gow skins. She’d cover both sides of the press with plastic wrap. Seems that would be easier than rolling out. 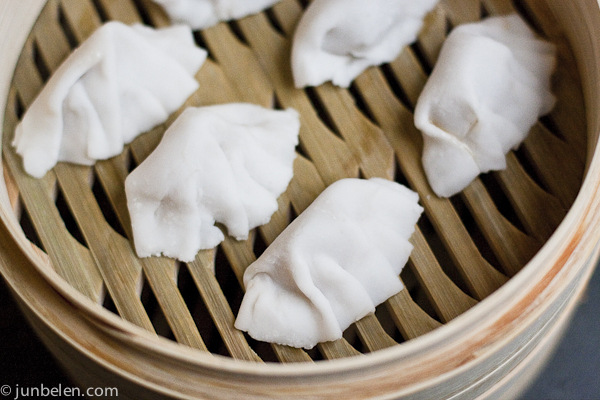 I alway prefer Har Gow to Siew Mai…and these shrimps dumplings definitely look very very good! wow! ang sipag! pati wrapper in-effort! 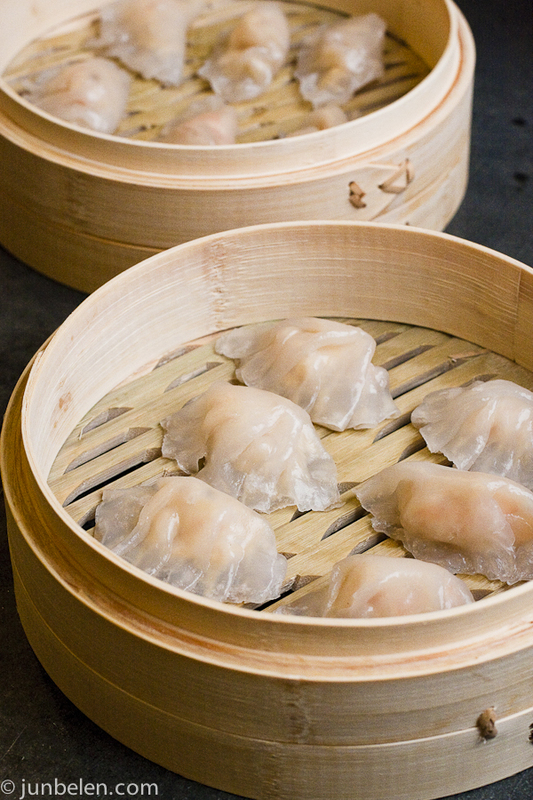 These are the loveliest dumplings… I love that you can see through them like some exotic deep sea fish… great recipe.. .i never knew how it was done!!! I tried making the wrappers with the same recipe, however my dough came out very sticky and was impossible to work with. What would be the reason for this? when you make the skin of the dumpling, how did the tapioca starch, wheat starch and water suddenly turn into dough? r u supposed to let it set? i am lost and without dough. please help. I had the same problem. Second time around, I made sure the cup of water was boiling (literally) hot when I poured it in. This gets the starch to react the proper way and bind up into dough. is there any substitute for the wheat starch? Here is a thread I found about substitutes for wheat starch: http://forums.finecooking.com/node/28345 Apparently, someone had success in using potato starch instead of wheat starch to give the same translucence and sheen. I hope this helps. Usually, wheat starch is available in most Asian stores. In search from the internet regarding the recipe of Har Gow, They varies in different measurement. Though I have made them successfully, still I am not satisfied with the glossiness of the wrapper. Would it be caused of the flour?